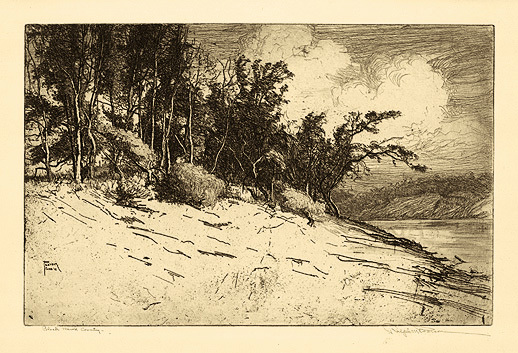 Black Hawk Country---1912, Etching, second state. Edition not stated. Signed and titled in pencil. Inscribed Rock River Series Second State. Image size 8 7/8 x 13 13/16 inches (225 x 351 mm); sheet size 11 5/8 x 16 3/4 inches (295 x 425 mm). A superb, atmospheric impression in dark brown ink, with selectively wiped overall plate tone, on cream wove paper; full margins (1 1/8 to 1 5/8 inches), in excellent condition. Shown at the Annual Exhibition of the Association of American Etchers, 1914. Illustrated in Year Book of American Etching 1914, John Lane Company, New York, 1914. 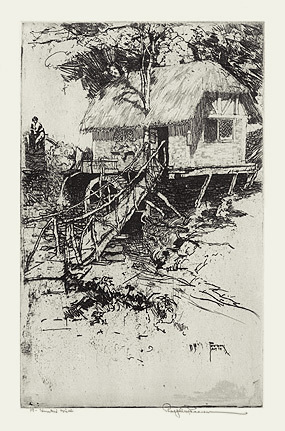 Hunter's Mill---1914, Etching, third state. Edition not stated. Signed, titled, and numbered 19 in pencil. Signed and dated in the plate, lower right. Annotated Third State in pencil, bottom center sheet edge. Image size 8 x 5 1/16 inches (203 x 128 mm); sheet size 10 13/16 x 8 7/16 inches (273 x 213 mm). A superb impression, with delicate overall plate tone, on cream wove paper; full margins (1 to 1 5/8 inches), in excellent condition.